Puzzle Piece Cars: Ghetto or Passion Project? Have you even repeatedly driven passed a car parked on the side of the road that always catches your eye? Whether it is an exotic, a classic, or a weirdly decorated car, you drive by it each time hoping the owner just happens to be standing by it so you can put a face to the owner of such an interesting car. 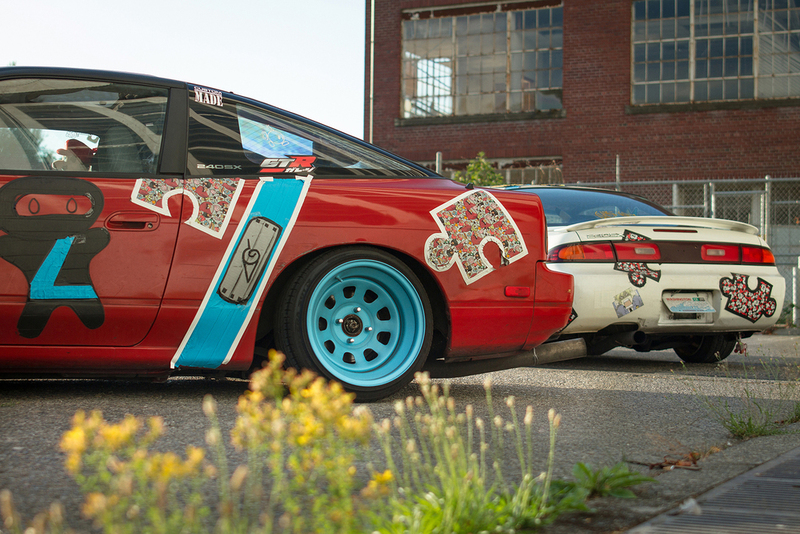 Enter the red Puzzle Piece 240sx. 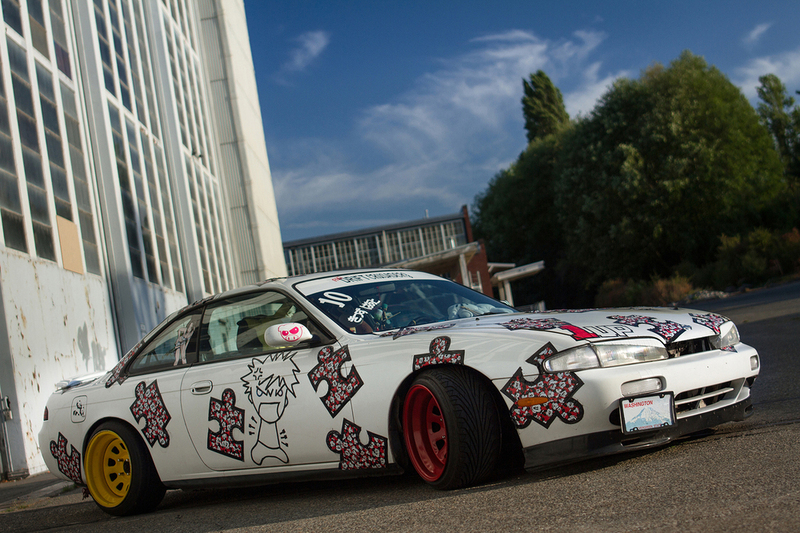 The first thing that acutally caught my eye about this car was the big Yoshi plush sitting on the steering wheel. Being a Nintendo fan and Super Smash Bros enthusiast, I found that hilarious and awesome that someone would actually put that in their car. Then I noticed the rest of the car. It was covered with not-so-precisely-applied anime themed duct tape in the shape of giant puzzle pieces. This puzzling design was complemented by more anime and Nintendo references. I was so intrigued by this car. So many people would see this car and simply write it off as being ghetto, but I saw it as being a passion project, someone trying to infuse their personality into their car. So I left my card on the car. Later that night the owner contacted me, and we set up a photoshoot at Magnuson Park. The owner is a young guy named Keshawn and he brought his friend, Malcolm who is the one that started the idea of the puzzle piece design. They have been long time friends and after watching The Fast and The Furious: Tokyo Drift -- (The only good Fast and Furious movie..."wonder if you know, How they live in Tokyo, If you seen it then you mean it, Then you know you have to go. Fast and furious! Kitaa! Drift, Drift, Drift!") 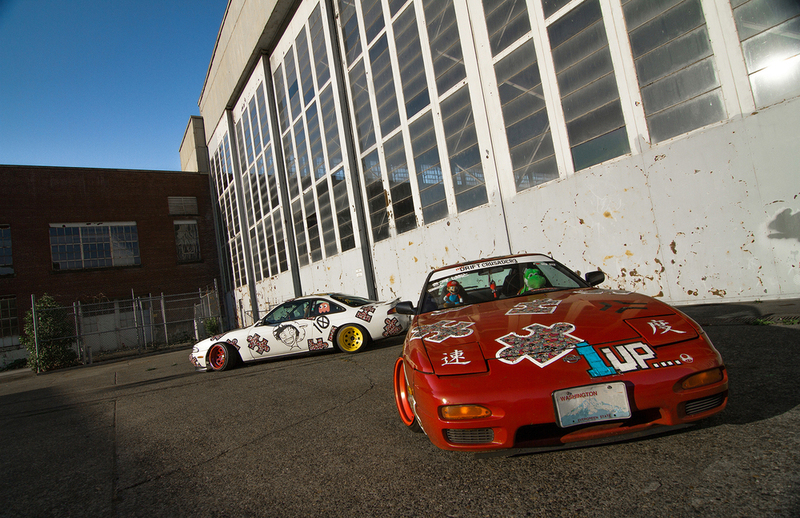 -- they picked up these two Nissan 240s, and the passion projects began. For a car guy, a car is never done, it's always a work in progress. What cosmetic piece can be tweaked to give it a better, more unique look? What performance piece can be installed to make it drive just that much better? Always tinkering, always imagining the next thing on the car bucket list. For Keshawn and Malcolm, they wanted something they have never seen before, something that would look like a crew livery, and something into which they could freely infuse their total heart and personality. Getting to know these two, it becomes very clear just how much of who they are is put into and onto these cars. Most people hide behind a drab monochrome wash car, desperately trying to blend in with the crowd. Even car guys will stray away from anything that could be considered ghetto or janky or not clean. So Keshawn's and Malcolm's all out there design is an unbashed breath of fresh air in the car community. I love it. I love the creativity behind it. When looking at these cars and admiring every little detail -- (of which there are many to find) -- like a game of I Spy, you wonder at the story behind each one, why the owner chose that piece, and how all the pieces connect to represent the owner. It's like a museum painting. 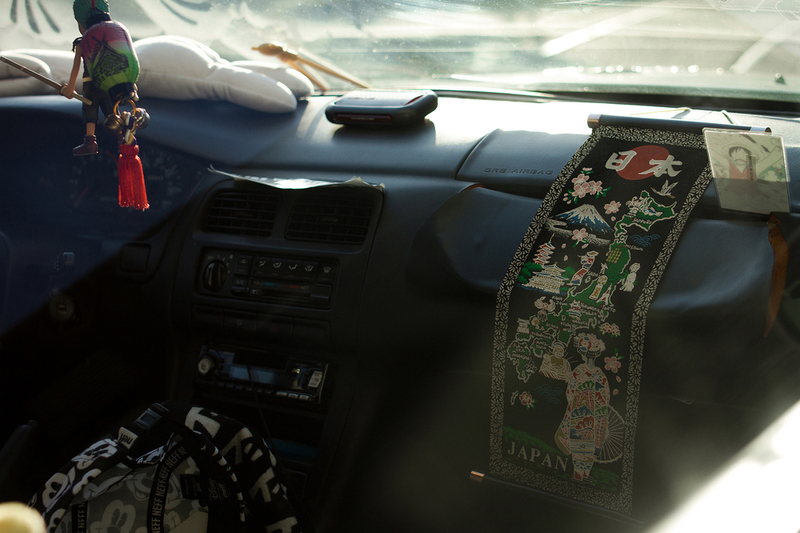 Cars are a canvas on which the owners can imprint themselves. So have a look through the photos and see what stories and personalities you can draw from these mechanical pieces of functional artwork.